Togakushi is an historic Japanese village nestling amongst 900 year old cedars and just a short drive or bus ride from Nagano City, Japan. Why not try a short stopover in this ancient Japanese village? There is a small reproduction ninja village and school open Spring-Autumn and it’s delicious soba noodles are also famous throughout Japan. The village is not only a beautiful place to visit in the warmer months because in winter there is a great ski resort with lots of the renowned Japanese powder. See the Togakushi Snow World Ski Guide for more information. Scroll down for more Togakushi accommodation options and Togakushi Village hotels. For further tourism information and attractions check out the Togakushi Tourist Guide. Situated just a 5-minute walk from historic Togakushi Shrine, Oshi Ryokan is traditional lodging accommodation in the peaceful mountain area, which used to cater for pilgrims. 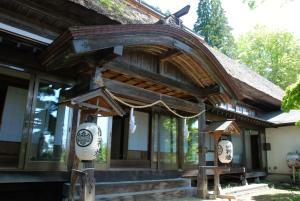 The main building is 250 years old with a thatched roof. Map to Oshi Ryokan.